How long does it take for a customer to form a first impression about you and your business? According to research cited by the Association for Psychological Science, most people form a first impression within about a tenth of a second. What do consumers experience within that flash of time? The sounds they perceive can have a deep impact on how they feel about your employees, your business, and your products. At Cloud Cover Music, we know first impressions matter. We also know that every business has different goals and different messages to share. 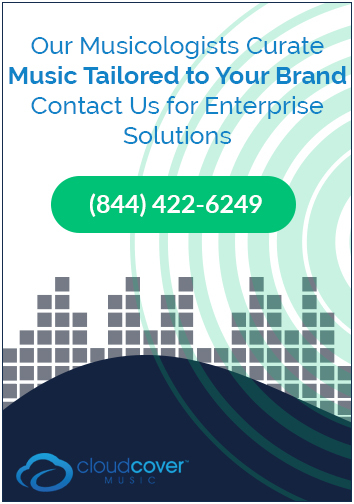 That's why we offer a sophisticated matching system that allows you to choose the music that is right for your business, your customers, and your budget. Here's how that process works. This survey takes just minutes to fill out, but it provides us with a great deal of information we can use in order to choose the music that is right for you. 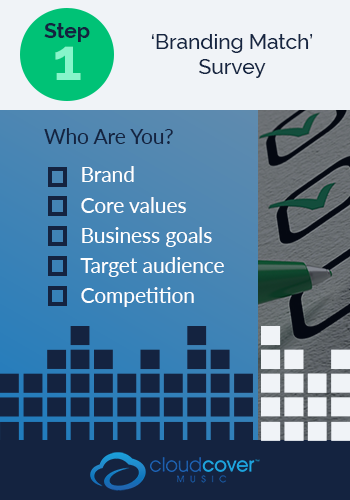 We can also use this survey to help us develop custom advertising messages you can play within your business to help you reach your sales and marketing goals. Everything is done electronically, so you won't have to set up an appointment. You can fill out the survey when you have time, and we'll use your answers to help us create a plan that is right for you. Just as we'd like to learn more about you, we'd like for you to learn more about us. During a 30-minute phone call with a dedicated account representative, we'll introduce you to our products and services. We'll spend time demonstrating our Tune application. You'll use this tool to choose music for your organization if a custom curation is not necessary. 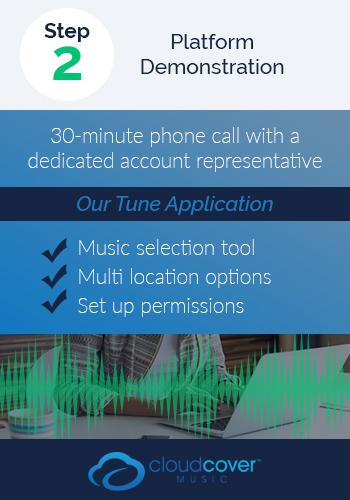 You can use the tool at headquarters only, or you can give people in franchise or remote locations the opportunity to choose their music from Cloud Cover Music’s entire library or any portion of the library. We will explain how the tool works, and we'll give you an opportunity to set up permissions that are right for your business. You can tackle this call alone, or you can invite others within your business that will work with our products and services. It's really up to you. At the end of this call, you'll understand just how our tools work. But we'll always be available to answer questions and offer support if you need additional help. This call will help you understand if you have the equipment you'll need in order to get the most value for your investment. We can also offer you advice on equipment to purchase if you don't have what you need on hand. This step is optional, but we find that many of our clients benefit from talking with key stakeholders early in the setup process. This step allows you to collect that feedback quickly and efficiently. So, for example, if you are a Marketing professional, you may need to consult with your IT and Operations teams... or vice versa. Our tools allow you to gather feedback from employees, peers, managers, key customers, and more. You'll send that data to us, and we'll incorporate that feedback as we curate music for your organization. We will review this information together, and you can make adjustments to this plan as needed. We want to make sure you get the program that is right for you, so we welcome your feedback. With our recommendations in hand, you're ready to fill your business with music and curated messages. But you won't be alone in your work. We'll check in with you between weeks one and two of using the service to ensure that everything is working as planned. We can adjust your program at any time and make sure you're getting the value you expect. We are always on call for you seven days a week! At Cloud Cover Music, we make it easy to fill your space with sound. 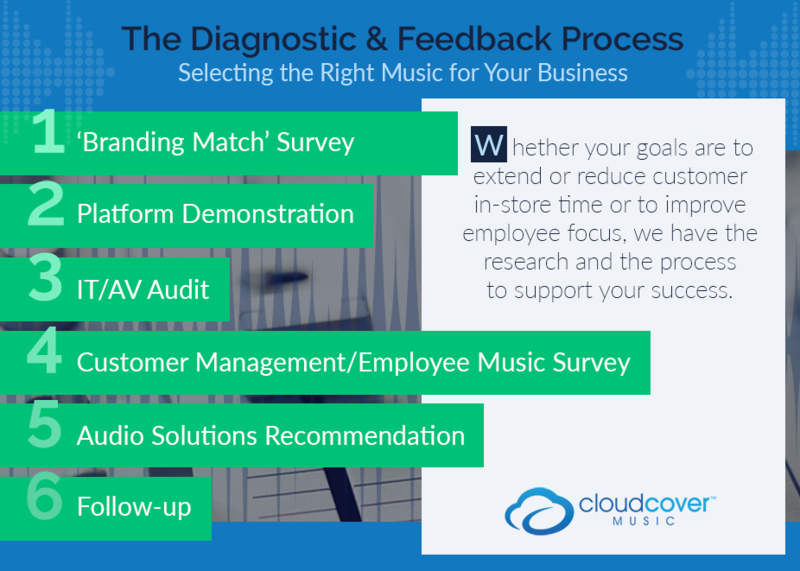 Just contact us at sales@cloudcovermusic.com to get this process started for your business. How Many Seconds to a First Impression? (July 2006). Association for Psychological Science.